Here are pictures of the finished dress. I am pleased with how it turned out. The collar makes me crazy but I figure after four times, I was leaving it and not re-doing another. It is on a pretty hanger in a bag and ready to travel to the fair tomorrow. Now have to get my travel stitching bag ready for the car. Martha, it is just lovely! Blue ribbon for sure! You get a blue ribbon from me! 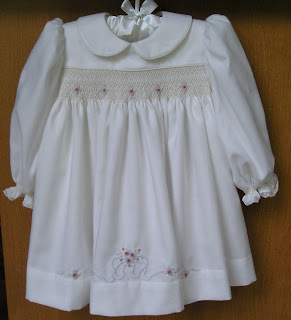 Your smocking and embroidery are just perfect. It's beautiful!!! The collar is lovely! :) Good luck! L O V E this, Martha! It's perfect! Thanks guys. It is at the fair and out of my hands now. I have another project on the table soon that I am going to practice my collars again. Martha...I think it looks fantastic!!! The colors look so wonderful together....calming and soothing. Your smocking and embroidery are amazing!!! Blue ribbon in my book for sure!!! I am hoping after this week, I would get a breather and start to work on my daygown again. 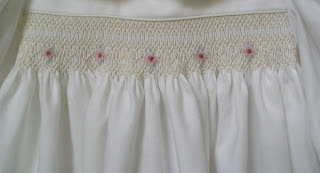 Thank you, I just found out last night, that it won Best in Show for the smocking division. CONGRATULATIONS!!!! That is so exciting!!! You should be so proud of yourself!!!!! Thanks Cindy. It is exciting. I haven't seen a picture of the best of show display yet. We are going back to the fair to pick up items on the 17th. CONGRATULATIONS, Martha! I expected this would take BofS! It is beautiful. Wow! and Congratulations!